First Lines: First came the crows. An entire murder of them. Circling the graveyard in strict formation, their dark beady eyes watching, relentlessly watching, their sleek black bodies buffeted by the wind. Strange things have been happening to Daire Santos. Animals follow her, crows mock her, glowing people appear from nowhere. Worried that Daire's having a breakdown, her mother sends her to stay with the grandmother she's never met, who lives on the dusty plains of Enchantment, New Mexico. There Daire crosses paths with Dace, a gorgeous guy with unearthly blue eyes. Her grandmother recognizes Daire's episodes for what they are – a call to her true destiny as a Soul Seeker, a person who can navigate between the living and the dead. Guided by her grandmother, Daire must be quick to learn how to harness her powers, because Dace's brother is an evil shape-shifter, out to steal them. Daire must embrace her fate as a Soul Seeker and discover whether Dace is the guy she's meant to be with... or if he's allied with the enemy she's destined to destroy. The beginning of this was a little tricky and I had trouble keeping my attention on reading this and trying to make sense of it. The very first chapter was good, it was the second that had me wondering what the heck was going on. I had to reread it for the second time for it to make a bit of sense but it wasn't until after I got past that and Daire was off to the Grandmother she had never known, that I really started getting into it. Once Daire is in New Mexico she's thrown into a whole new world where the visions she has start to make sense. Paloma, her grandmother helps her deal with these and sets her on a spiritual journey to help Daire fulfil her potential as the next Seeker. I liked how Alyson did this part but I hoped for Daire to lose control of her powers a little bit more and actually use them in a really big way to get herself in trouble. For me the only thing that bugged me about the whole scenario was that she seemed to fit quite in after only a little bit of conflict with the school. In saying that she still had Cade and his family to deal with. Dace was a very welcome addition to the cast of characters I must say. While there weren't the whole "Wham Bam" fire works for me, I really did like the character he was. A little too good for my liking, but still lovable none the less. Xotichl (So-chee) was pretty awesome as well but when I first come across that name I'm like "Holy Dooly what a name" lol. But it's one that I really like. 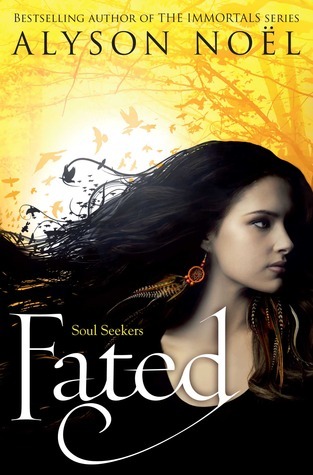 Fated is only the beginning of what I hope is a very promising series by Alyson Noel. What I do hope is that in the next book, the build up to the "BIG SHOWDOWN" has a little more suspense. In saying that I really did enjoy this and look forward to reading the next one in the series. (1) Finished copy of Fated is up for grabs. All you need to do is comment on this post and check back here on the 20th June to see if you are the lucky winner! !